When it comes to carrying out office work there is no doubt that Microsoft Office 2010 is one of the best elections possible. What can be considered the office suite par excellence is a perfect product when it comes to working at a professional level as well as at home that has reached version 2010, in a continuous race for the implementation of new options and features with which it can satisfy the building demands of the users. A pack of improvements that have been exclusively provided for this SP1, that cover from fixing how the product works in general to security, stability and performance improvements. Pack of updates published up until June 2011 and the cumulative updates published until April 2011. Microsoft Office 2010 SP1 provides the latest updates for Office 2010. The database tool by Microsoft has suffered a direct change, allowing us to integrate community contents in the element gallery from the application as well fixing some problems when exporting files to Excel books. It has also improved the performance when it comes to publishing forms that contain embedded images. OneNote 2010 is one of the programs that has received most work on in Microsoft Office 2010 SP1. OneNote 2010 allows us to store all kinds of files to be shared with other users. This update will take care of adding new options, especially with regard to the synchronization of files with Windows Live SkyDrive or with SharePoint. Furthermore, they have fixed several functioning problems and errors detected in the application as well as matters that affected its general performance. The email client hasn't been less and with this update it includes compatibility with Office 365, new configuration options to convert an account into the default account when sending files and some minor corrections. The presentation and slideshow creation tool is another program that has been improved. In PowerPoint 2010 SP1 it has been necessary to carry out various improvements due to the many problems that had appeared. They have fixed all kinds of errors, from visualization problems and interface faults to other matters that directly affected inserting images and other compatibility matters with files between platforms. 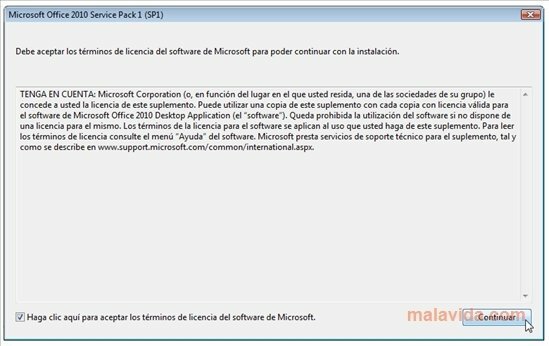 If you're a Microsoft Office 2010 user, don't wait any longer to download Microsoft Office 2010 SP1. This pack includes all the improvements that are necessary for your software to work as well as possible, once all the errors that it contained have been detected and fixed. 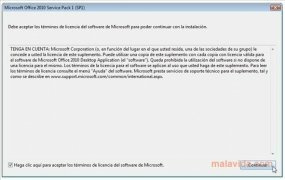 Download Microsoft Office 2010 SP1 for free and enjoy the office suite updated. Runs on Windows XP SP3 or above.